"The forgotten men and women of our country will be forgotten no longer," the president-elect told a packed room of supporters at the Hilton hotel. "We will get along with all nations willing to get along with us," he added. What does this stunning turnaround mean for the rest of the world? The Conversation Global asked a panel of international scholars to reflect on Trump's election and assess its significance for their region. 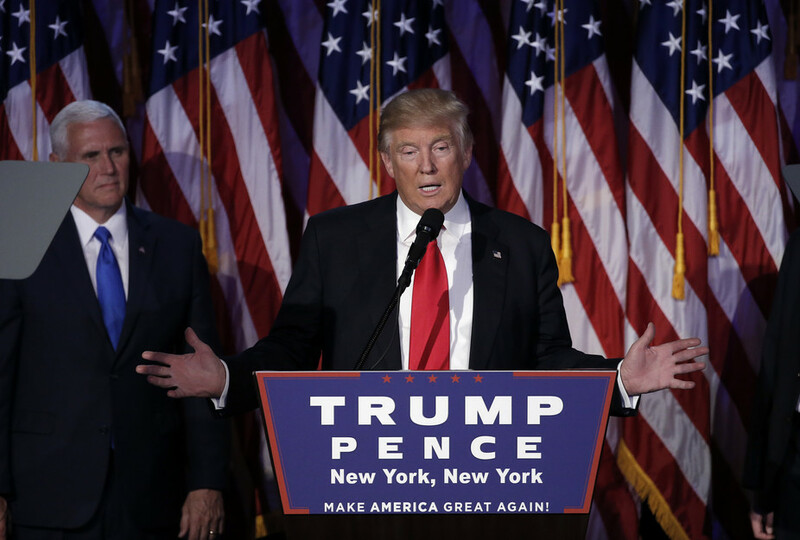 In a stunning electoral upset, Donald Trump has defeated Hillary Clinton to become the 45th President of the United States. Virtually every pre-election forecast suggested a comfortable or even decisive Clinton victory. Instead, Trump - a man that many European leaders and citizens view as manifestly unqualified and unprepared for the position - will become president of the world's sole superpower in January. Trump's victory is almost certainly being met across European capitals this morning with alarm, shock, and dread. Trump has called the NATO alliance "obsolete", spoken admiringly of Russian President Vladimir Putin, and said the British vote in June 2016 to exit the European Union was "a great thing". In London, spectators react to the television coverage of election. Unlike in the United States, the European public was solidly against the idea of a Trump presidency. In a poll published by the Economist on November 8 showing how other countries would vote in the US election, huge majorities favoured Clinton. According to a Pew Research survey published in June, overwhelming majorities of Europeans polled said they had "no confidence" that Trump "would do the right thing regarding world affairs". Now European leaders must anticipate how a Trump administration will affect transatlantic relations and the many common challenges the United States and Europe face, from an increasingly assertive Russia, a relentless migration crisis that threatens to tear Europe apart, and Britain's future in the EU. More broadly, Trump's election questions the future of US global leadership. Since the end of World War II, the United States, along with key European partners, built and then sustained an open, rules-based international order defined by free trade, military alliances, and international institutions such as the United Nations, International Monetary Fund, and World Bank. With Trump's victory, the very future of this liberal international order is in peril. With so many countries in the region already leaning toward China, does Donald Trump's election to the US presidency matter for Southeast Asia? It does, at least a little. To see understand how, imagine what the impact would have been if Hillary Clinton had won. She maintained a strong interest in trade, even if forced by voters during the election campaign to backtrack on the Trans Pacific Partnership. She vigorously denounced China's takeover of the South China Sea, even as claimants in Southeast Asia have begun to cave in. And she might have retained some of the good will in Indonesia -- and in Myanmar -- that Barack Obama was able to generate. So Clinton might have slowed, though not reversed, China's suffocating embrace of Southeast Asia. After all, Southeast Asia is not a topmost concern for the US. But for China, it is. And China offers leaders in the region irresistible inducements, namely, near bottomless investment and lending for high speed railways, ports, and energy grids. To be sure, as the bills come due and exclusive economic zones are lost, citizens may rue the terms into which their leaders have entered. But by then, Hillary Clinton's presidency would have passed. By contrast, with Donald Trump in the White House, Southeast Asia's entry into China's orbit will quicken. Indeed, his repudiation of trading relations and security commitments seems to leave countries in the region with no alternative. And his anti-Muslim vitriol will add steam, especially in Indonesia, Malaysia, and the Philippines. Trump's presidency, then, will accelerate Southeast Asia's progress along China's new Silk Road. But interestingly, by doing so, the costs for Southeast Asia may grow apparent much sooner. Guests at Hillary Clinton's election night rally watch returns at the Jacob K. Javits Convention Center in New York. Donald Trump taking the reins of the US presidency could mark the sunset on Pax Americana in the Asia Pacific, and clear away any remaining resistance to China's rise to regional preeminence. The US rebalancing in Asia under President Barack Obama, and the country's alliance commitments in the region could also be severely undermined given Trump's lack of appreciation for the role played by America's security relationships in US global political and economic leadership. The only hindrance to this lies in the fact that US geostrategic policy for the Asia-Pacific has been a largely bipartisan matter in the US Congress. But Trump's tenuous links to the Republican Party, lack of real leadership thereof, and non-attachment to Republican ideals, puts into question the responsiveness and effectiveness of that policy in the face of more solid and coordinated leadership within regional powers such as China and Russia, which will have an unparalleled opportunity to fill in any voids the US may leave.